The scenario I chose is “The Patrol”. The premise is a Mad Guru has roused the local Thuggee cult members and has convinced them to attack the infidel British. I have altered the scenario to have the Pathans revolt in place of the Thuggee cult. The village of Tantrapur has been attacked, the local political officer and village chieftain have been murdered, the telegraph station sacked, and telegraph poles have been cut. No word has been heard from the village in several days so a patrol of Indian troops commanded by three British Sergeants has been set out to recon the situation. I will post more about the scenario and AAR in future posts. For now I will post what I’ve been working on for the game. In my humble opinion it can be the small details in a scenario that really help make the game and the table set up come to life or have that certain feel for the period and the scenario. With this mantra in mind it was off to the work bench to get started. If you’ve seen the movie Gunga Din then you know that there is a scene where Sgt. Ballantine (Douglas Fairbanks Jr.) jumps into the engineer wagon and pulls out some dynamite. They use this dynamite to great visual and entertainment effect. Barring any historical limitations, it happened in the movie, thus it will happen in the game. Well I didn’t have a painted wagon in this scale, but I did have a covered wagon pencil sharpener of the approximate scale that I had purchased for $1.00 some 10 or so years ago! So off to the storage bins I went to locate this small gem. Much to my surprise I found I had purchased (5) of them, outstanding! I removed the pencil sharpener out of the back of the wagon then started to rebuild the gaps and modified it to suit my needs. I used bits of coffee stirring sticks to fab a new bed floor and to patch the sideboard holes. I added a falling tongue and single tree components with a bamboo skewer and Gorilla Glue. Once dry I primed it all black then painted it in the Foundry (3) tone “Spear shaft” colors. Engineer wagon in the center of the vill. I didn’t have any draught horses so I grabbed a set of Old Glory Oxen from an Ox Wagon set I’d purchased from my buddy Nick Zizo who sells OG colonial items. The yoke fittings were broken so I had to fabricate a new one myself from balsa wood. No easy task for an old man with bad eyes and shaky hands…lol. I had cut and shaped the yoke from balsa wood to match the scale of the OG oxen, then fabricated the metal fittings from copper wire, drilled the holes for the fittings, fabed an “o” ring as well, then gave the yoke the same painting treatment. The metal was painted with a mix of black and gun metal. 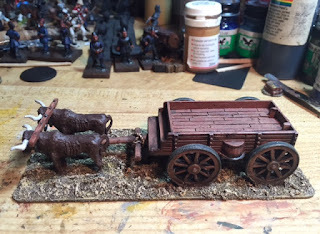 Once everything was painted and glued onto the base I gave everything, including the oxen a black wash. I had to go back with a little bit of dry brushing to lighten it back up once it dried. I had used my favorite basing compounds, Golden Gel Mediums, adding a little sand and rocks to add more depth for the NWF region that this piece was going to see action in. I will add a bit of tufts or a bush or two and then dulcote the model with Testors flat spray sealer. Since posting this entry I’ve found another gamer who’d used these same pencil sharpeners to much better effect than I had. I will copy some of his techniques for my follow up pieces. The next entry will be how I modified and built this small but fun piece out of a $1.00 pencil sharpener.